Canadian Civil Liberties Association–January 25, 2014–On January 24th-25th 2014 academics, practitioners, community members, and students have been gathering at the Schulich School of Law, Dalhousie University to discuss and examine the state of Aboriginal rights in Canada. The biennial IDEALaw conference has never seen a comparable response in numbers and media interest. The line up of speakers, cultural events, and discussion focus of the conference has created a buzz in Halifax. 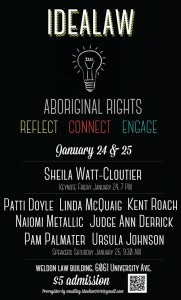 Organized by students, the conference attempts to address a number of pressing issues facing Aboriginals. Environmental concerns, poverty and criminal law issues, and police and institutional responses to protest are all on the bill. The conference was develped to encourage discussion and openness to new approaches, different perspectives, and engaging the public in legal and political action in response to community concerns. While the conference is ongoing, all talks thus far have addressed the chilling effects of organised and concerted rights abuses on the civil liberties and human rights of Aboriginals in Canada and abroad. The conference opened with a fascinating and rousing talk by Sheila Watt-Cloutier on human rights. Her experience as head of the Inuit Circumpolar Conference and own experiences as an advocate for Inuit in Canada and overseas gave a fascinating and “on the ground” perspective on alternative ways to perceive climate change. Her commentary on and analysis of the success attached to the ICC’s Petition to the Inter-American Commission on Human Rights Seeking Relief from Violations Resulting from Global Warming Caused by Acts and Omissions of the United States set the tone for continued discussion into the night. Of particular interest to most was the role of democratic and social rights and their protection in communities facing significant and overwhelming changes due to environmental impact.